Golestan Province under water, after the flooding. 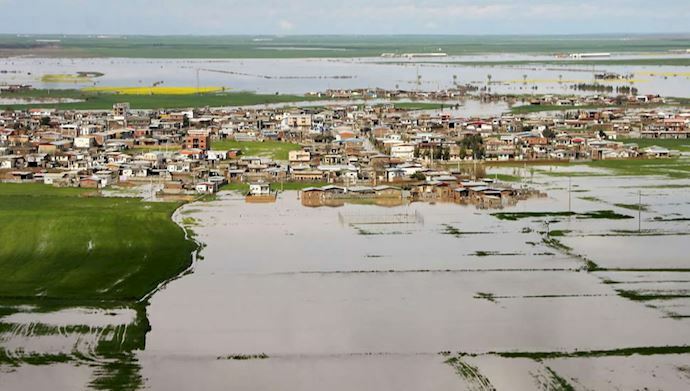 Maryam Rajavi, the president-elect of the National Council of Resistance of Iran (NCRI) issued a statement expressing her condolences for the victims who died in recent flooding in Northern Iran. 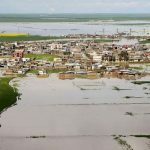 Nine people died in heavy flooding in Mazandaran and Golestan Provinces in Northern Iran last weekend. One further victim is still missing. Floods are hitting many provinces across #Iran, including Golestan, Lorestan, Fars, Khuzestan and Kermanshah. 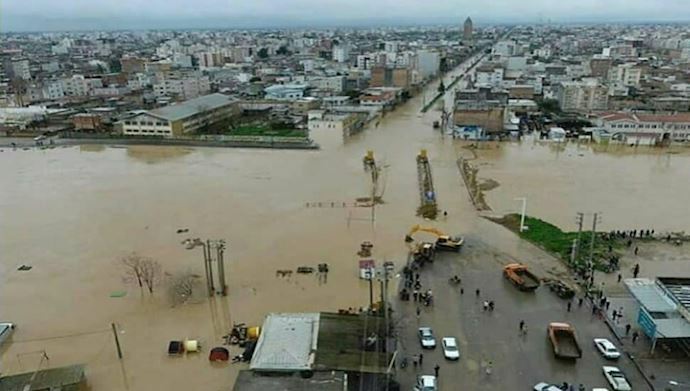 Reports from MEK sources inside Iran indicate that the flooding affected more than 20 villages in Golestan and 200 in Mazandaran during the country’s Nowruz celebrations, turning a time of celebration into a time of grief and tragedy. The town of Agh Ghola in Golestan was among the worst hit by the flooding. The heavy rains caused landslides. Around 70 roads leading into the province are also reportedly inaccessible, leading to a shortage of food and water in the affected areas. Other affected areas include Shiraz, Fars, Lorestan, Khuzestan, Sistan, Isfahan, Kermanshah and Ilam. Mrs. Rajavi expressed messages of solidarity and condolence with those affected. She called on the nation’s youth to come to the aid of those affected by the flooding. She told Iranians that it was their national patriotic duty to rally around the victims and provide aid where they can. She also pointed out the regime’s inaction. In places where the regime has taken measures, they have often exacerbated the situation. Years of corruption and embezzlement have left Iranians with few resources to rebuild their property and their lives in the wake of this national catastrophe. They have hollowed out Iran’s institutions through greed and the pursuit of nuclear weapons and regional warmongering. The regime is, therefore, woefully ill-equipped to manage the effects of natural disasters like this week’s flooding. The NCRI’s statement read, “our citizens’ damages in lives and belonging [sic] in facing such calamities are higher than the world and other countries’ standards.” It accused the regime of misappropriating resources from those affected to “repressive organs” like the Islamic Revolutionary Guards Corps (IRGC). As Khamenei, Rouhani, and other ruling mullahs turn a blind eye on the pain and suffering of the people of #Iran and are solely focused on preserving their own regime, independent popular rescue efforts are an urgent nationalistic duty. For the regime, the priority is self-preservation and the quashing of any protest or opposition to their political and religious tyranny.